Peanut Butter Salted Caramel Squares. For peanut butter lovers, you know who you are! A crumbly peanut butter base covered with a thick layer of sea salted caramel and finished with a nobbly milk chocolate and peanut butter topping. Yes, really! 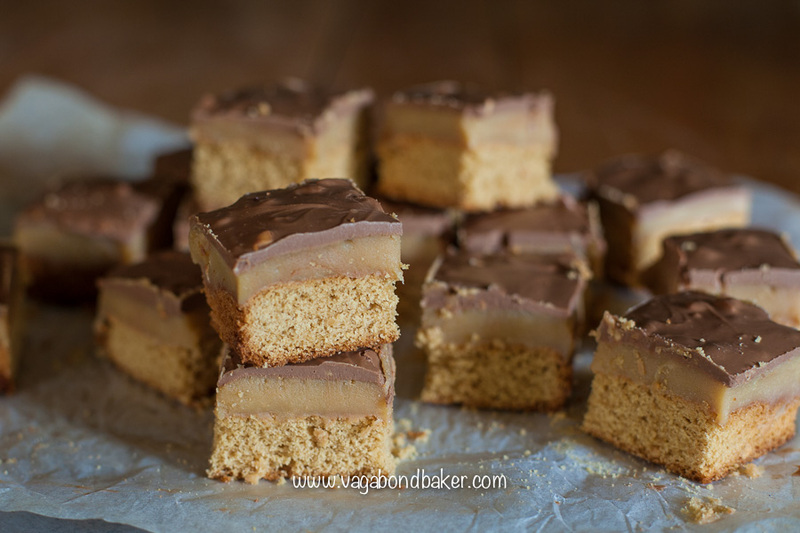 They’re a lot like a peanut butter version of Caramel Shortbread, but with a more substantial crumbly base layer. I found a recipe for chocolate peanut butter bars in the Ballymaloe Cookery course recipe book, a great book that I often forage through when I’m house sitting at this current location. The owners have a wonderful selection of recipe books that keeps me entertained for hours, gleaning ideas and inspiration. I baked them for my fella, thinking he would love them, however he remarked that they would be better with a caramel layer. Challenge accepted! 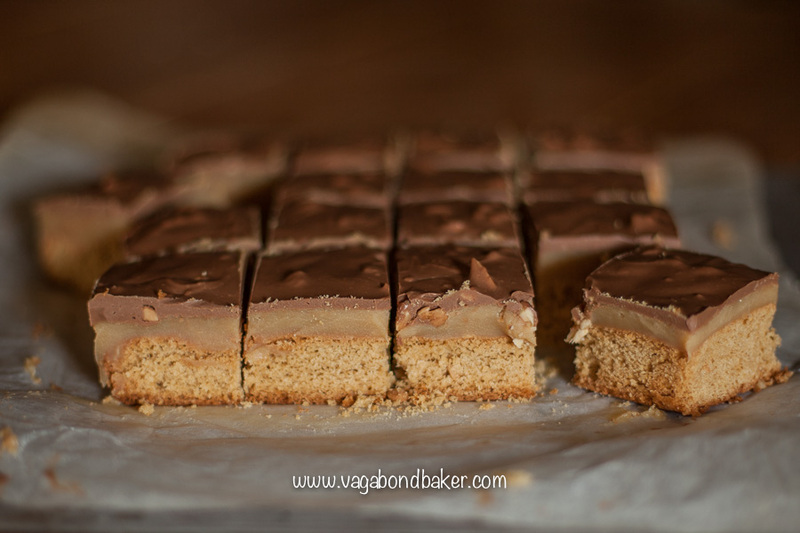 I’ve halved the base recipe from the book so that I could use the caramel quantity from my caramel shortbread recipe, the topping is pretty much the same as the book except I’ve added salt, which I think really brings out the peanut butter flavour. 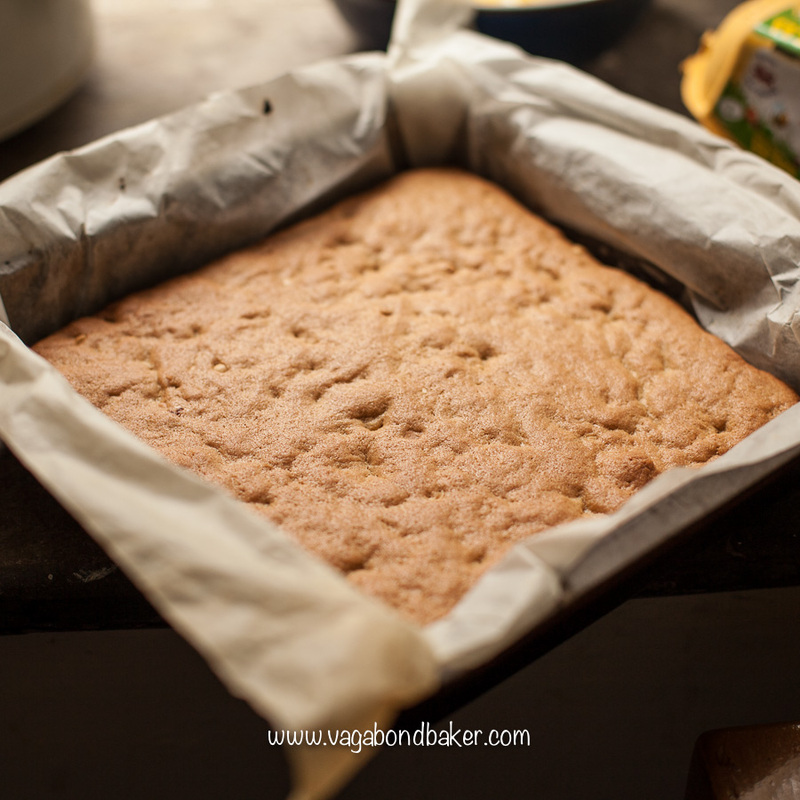 I baked the squares in a 20 cm square tin which made them pretty fat, you could use a slightly larger brownie tin and get a thinner bar if you prefer. 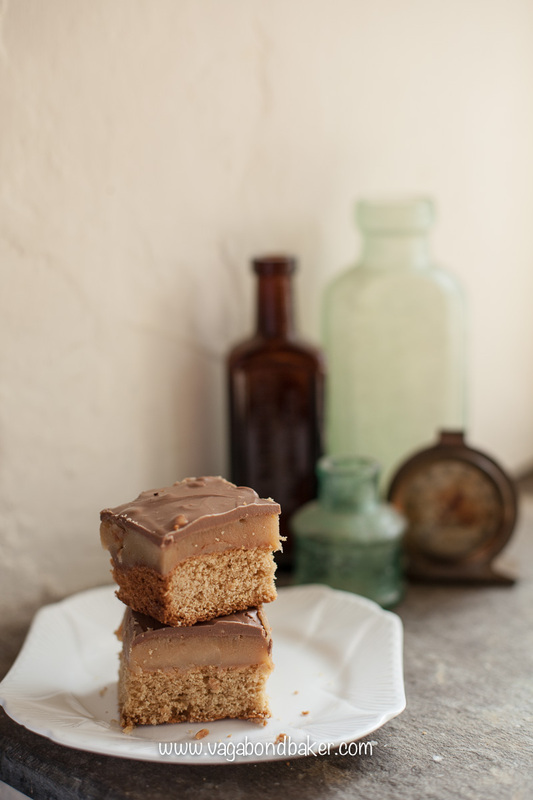 It goes without saying that these peanut butter salted caramel squares are pretty naughty in the calories stakes, but a little treat every now and again is good for you, right? You’ve baked them, so you know what’s in them, no nasty fakery here! 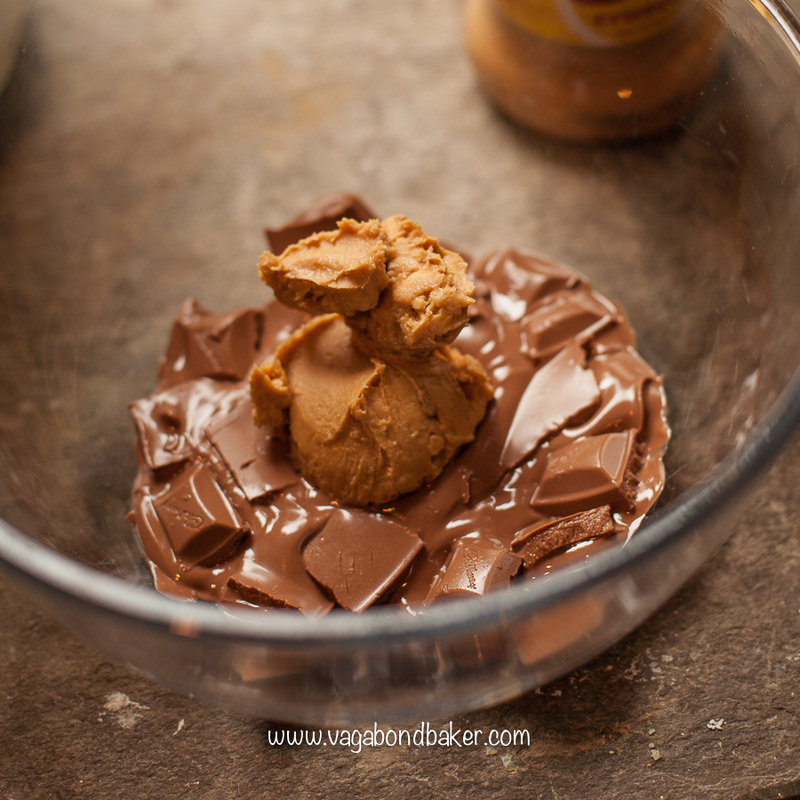 Buy a good quality peanut butter which is packed with peanuts, none of that over-sugared junk, a 95% peanuts PB is what you want for this recipe. 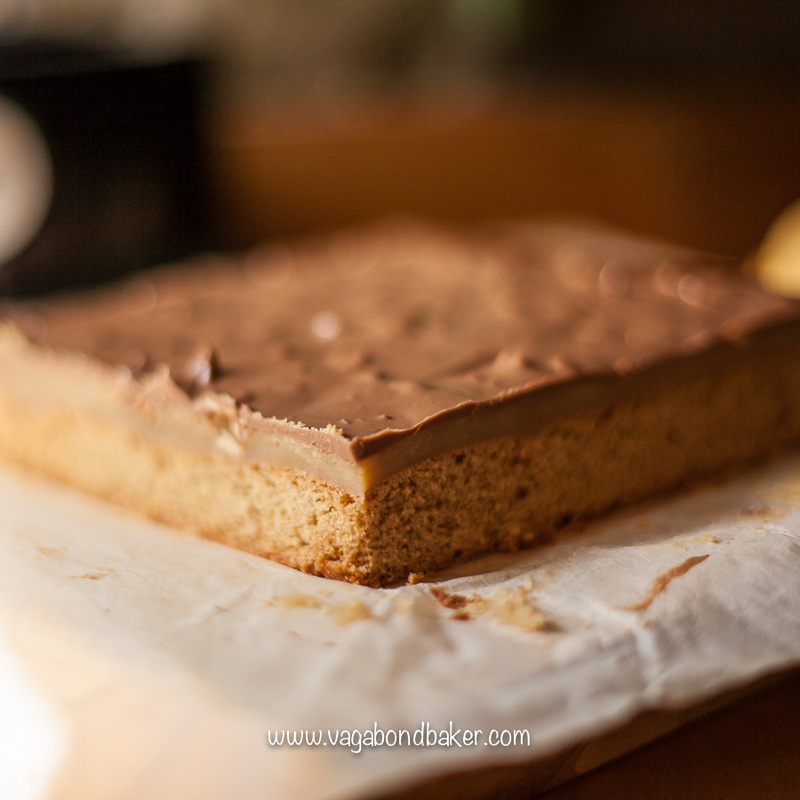 adapted from a recipe for Chocolate Peanut Butter Squares in the Ballymaloe Cookery Course book by Darina Allen. 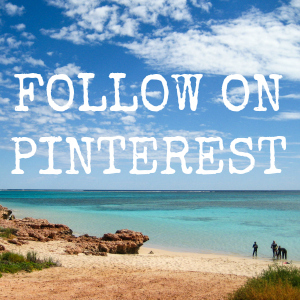 Simply sift the flour, baking powder and salt into a mixing bowl. Add the sugar and rub everything together with your fingertips to remove any lumps in the sugar. Add the soft butter, the peanut butter and the egg and mix everything together into a soft dough. Transfer to the prepared tin and push it out to the corners, levelling it. Bake for 18 to 20 minutes until just firm. The trick to this stage is not to rush it. If you don’t cook the caramel long enough it may not set stiff and your Peanut Butter and Salted Caramel Squares will be a delicious mess. Begin to melt the butter in a medium-sized pan. Add the condensed milk, the sugars and the salt. Melt everything together over a medium heat until all the sugar has dissolved. Bring to the boil, stirring regularly to ensure it’s not catching on the bottom of the pan. 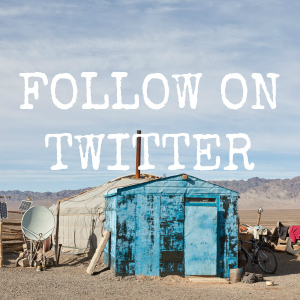 Once it reaches boiling point, turn the heat right down to very low. 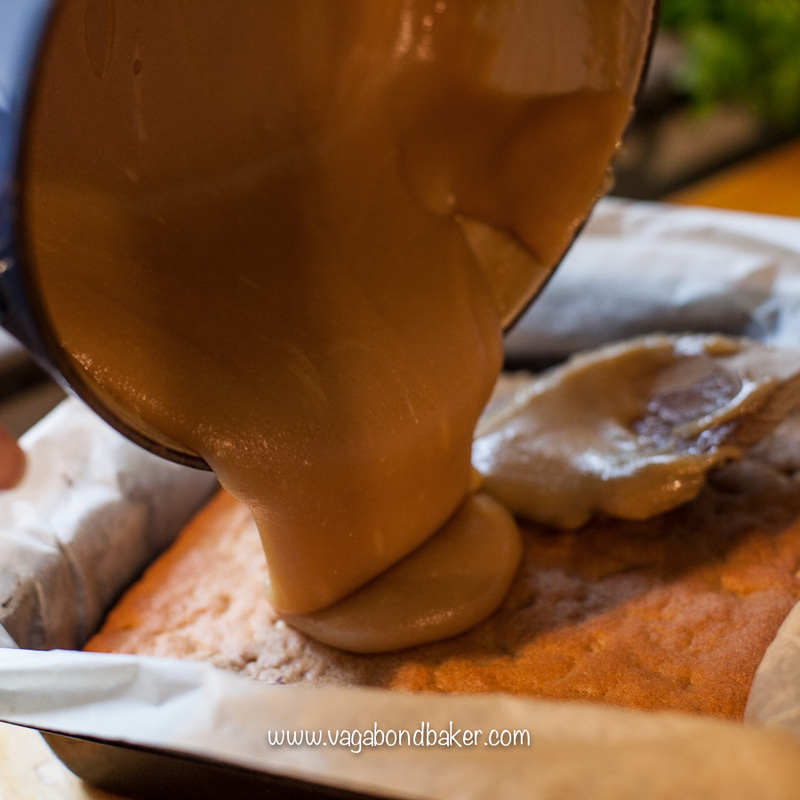 Keep cooking the caramel for around 10 minutes, slow and gentle. Stir it very often. Those ten minutes will pass a lot quicker than you think. 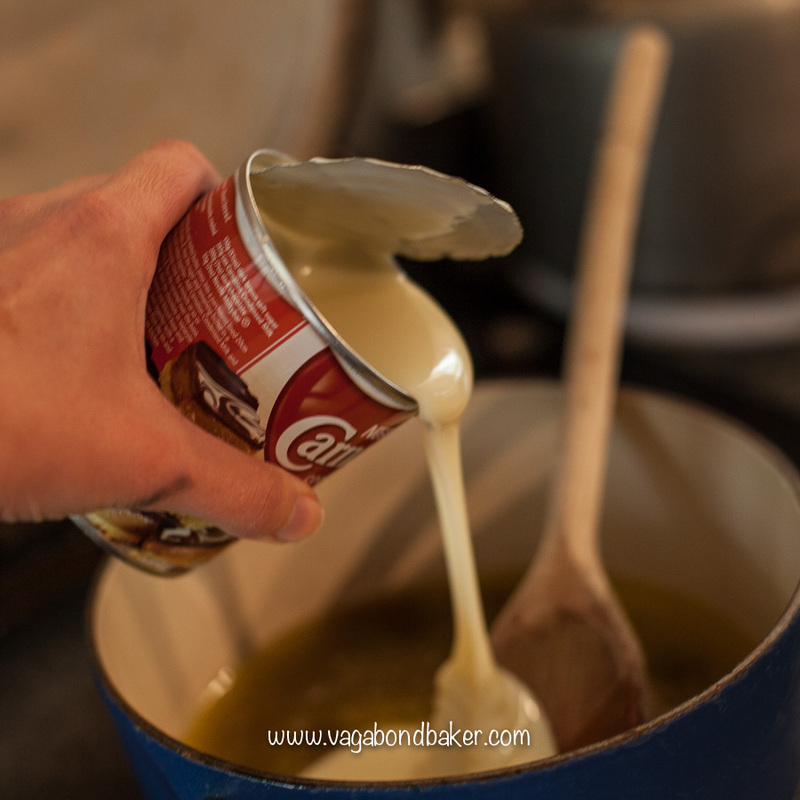 The caramel will have thickened. Pour over the cooled base and allow to cool before placing in the fridge to set firm. Melt the milk chocolate in a glass bowl over a pan of gently simmering water. Ensure the bowl doesn’t come into contact with the water. Alternatively, melt it carefully in a microwave. 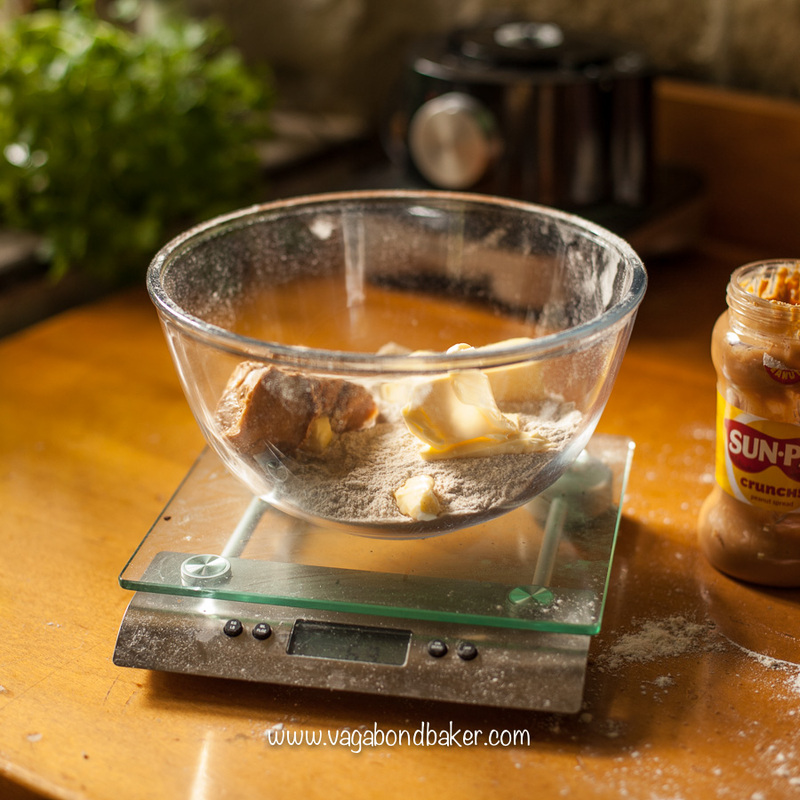 Stir in the peanut butter then add a small pinch of salt to bring out the peanut butter taste. Try it. Return to the fridge to allow the topping to set, it won’t set as firm as just chocolate would. Use a sharp knife to cut it into 16 squares. Heating the knife in hot water, then drying it with a cloth before cutting each slice makes the job much neater. 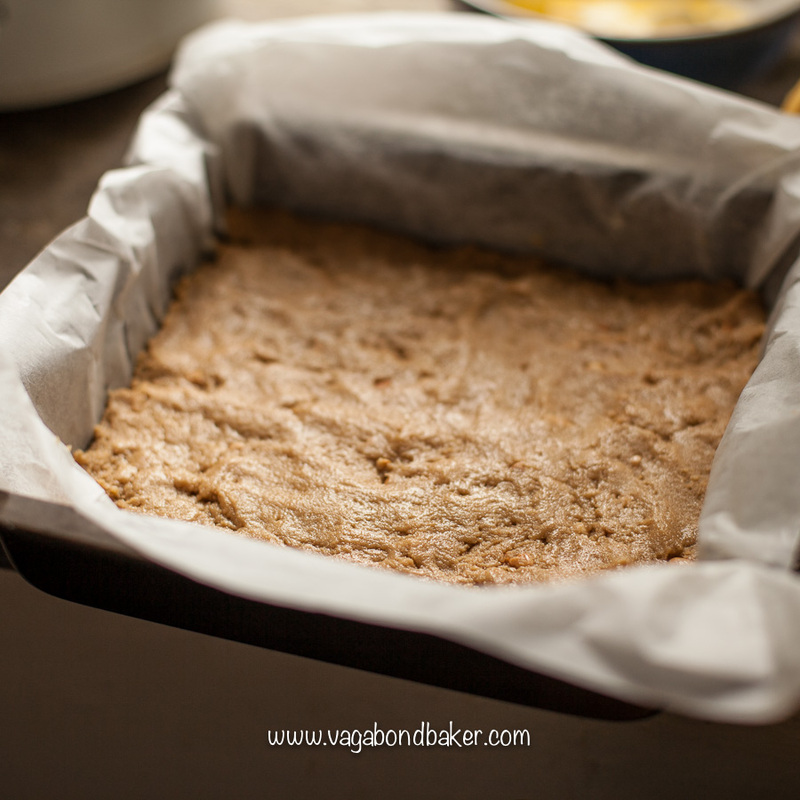 Preheat oven to 180F/350C/gas4 and line a 20cm (8in) square tin with parchment. 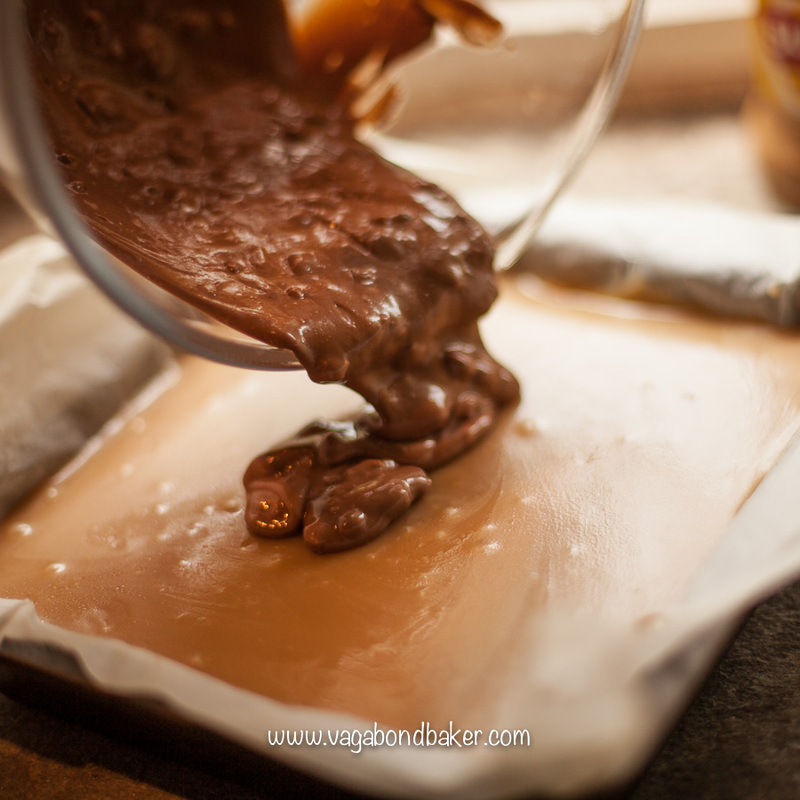 Pour over the caramel layer and spread to cover. Allow to set. If you don’t cook the caramel long enough it may not set stiff and your Peanut Butter and Salted Caramel Squares will be a delicious mess. 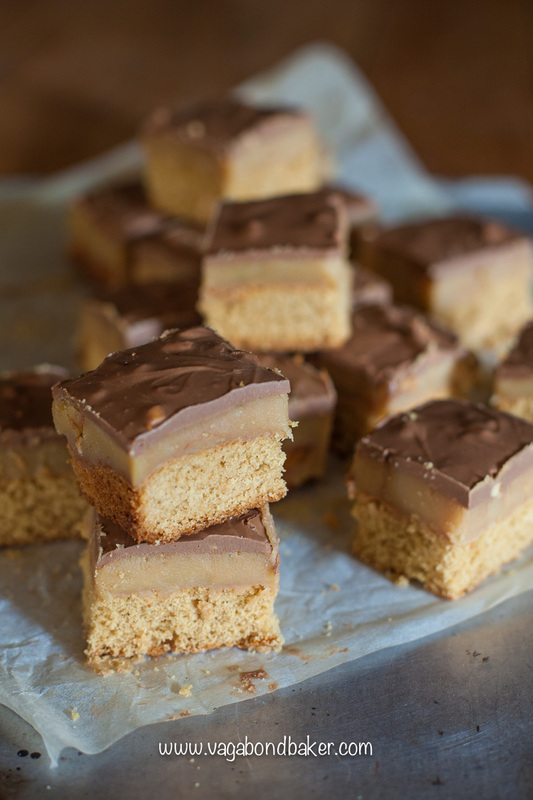 Caramel Shortbread aka millionaires shortbread! Peanut Butter Choc Chip Cookies amazing, and vegan too! 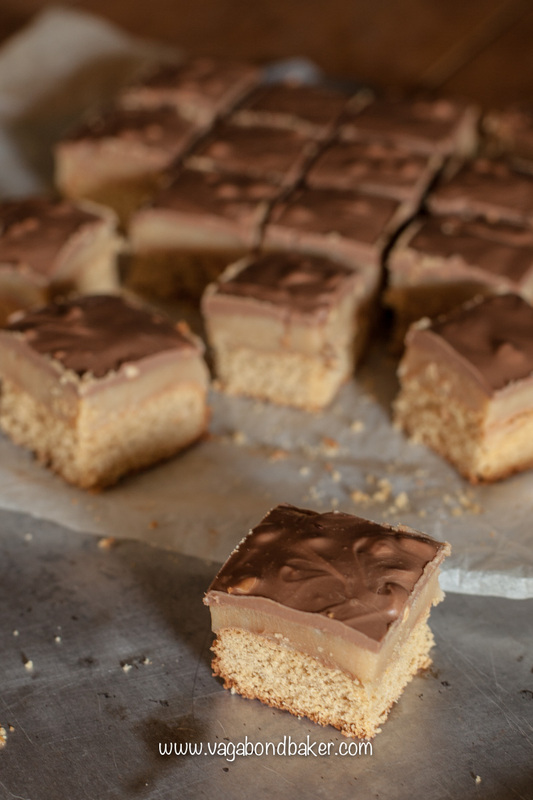 Peanut Butter and White Chocolate Blondies yes, they are as good as they sound! Also they’re gluten free. How much do you love peanut butter? 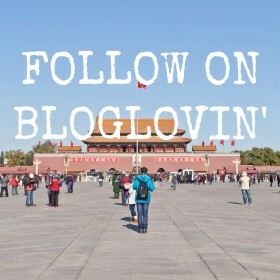 What’s your favourite brand? WHAT. SHUT UP. Am definitely going to try these this weekend! I have new recipe Sunday with my bestie, so this is going on the list of things to make! Woohoo! Awesome! Peanut butter lovers unite! Yes! I am a peanut lover, and these squares look utterly delicious (and unhealthy) 😀 Perhaps I can make a healthy vegan alternative? I like the idea with salt. . . thank you for that! I’m sure they could be veganized with a little experimentation. The base, fairly easy with vegan marg and egg replacer. I don’t even know where to begin, this just sounds incredible! Hahaha, they’re so yummy! I now crave them!